I just entered a guest blog post for you, and I hope you like it! Well, I do try to maintain structure to the posts I send--- but Fridays can cover almost anything: I've done history, crafts, gardening, videos, I'm going to soon do American Sign Language, sewing etc. If you want to write something other than humor or faith, just select the Friday box, what are you thinking of? How do i send you my guest post? and do you want something pacific? can i do a fashion post? I put your link on the side of my blog!!! can you put mine on your blog? I don't know if you go my last comment put i put your ad space on my blog!!! Can you put my ad on yours??? I would be willing to do a guest post if you would like. :) My blog is creatingpreciousmoments.blogspot.com. I hope you check it out and follow by email and leave a comment while you're at it!! Hey! 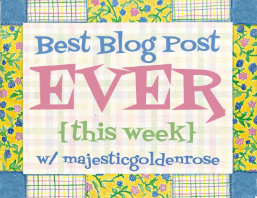 I just entered a guest post for you! I hope that you like it! !